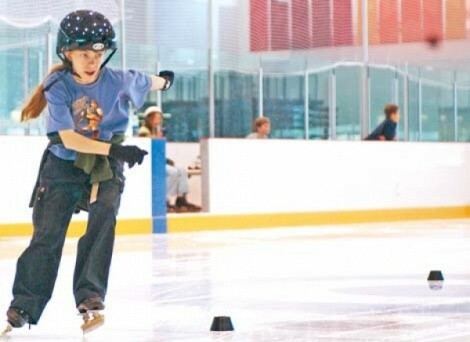 Get your blades onto Olympic-quality ice at the Kearns Oval. One of the best-kept workout secrets in town should really stay that way. So why am I telling you to go have fun at the Olympic Oval in Kearns? Because it’s just too good to keep secret. Take ordinary ice-skating rinks, for example. At those dinky things, a few strides and you have to turn, so your right leg gets all the exercise. But the track at the oval is a quarter mile long, so you’ll skate in a straight line for enough distance to work both legs. Plus, the oval track is so wide, you’re not dodging people all the time like you have to do at smaller ice rinks. There’s a public-skating session Monday through Thursdays from 7-9 p.m. and Fridays from 7-10 p.m. Saturdays are a marathon of skating: You can enjoy the glide from 1 in the afternoon until 10 at night, or any portion of it; you can even leave and come back. The Zambonis chug out often enough to keep the ice smooth. There’s even a Sunday session from 1-3 p.m.
Here’s another exceptionally cool thing about the oval: You can rent three kinds of skates. The place was made for speed skating, so if you’ve never done it, why not try a pair of speed skates with the long blade? Or, if you’ve never tried hockey skates, give them a shot (so to speak); you’ll be surprised at how much more agile they allow you to be. And in case all of that wasn’t cool enough, the cost for a public-skate session is $4. The cost to rent a pair of skates is $2. If you can’t afford a movie, you can still afford the oval. The oval is also the place where the U.S. speedskating team trains almost every morning. Yes, that team, including those going to the Olympics next month. Pearson reveals that there’s no charge to drop in and watch. The oval is the team’s home until they move into the Olympic Village at Vancouver. So how cool is this: You call the oval to find out if the team is training that day, and you go over to watch them. You see the behind-the-scenes reality of how Olympic athletes get ready for the games. You watch Chad Hedrick, Apolo Ohno and other medal champions, you observe their intensity, you see the muscles they have built for competition … and you’re inspired. How many places allow you to experience that?